We've developed free training content and curriculum to support job seekers as well as nonprofits and volunteers who are committed to creating a world with equal access to opportunity. Use the content below to learn how to leverage LinkedIn as you build a meaningful career. We're here to help you create a high-quality profile, build a network and boost your professional brand on the platform. This presentation demonstrates how to use LinkedIn to build your brand, develop a professional network and find jobs. This presentation will explore the importance of professional branding and how you can use LinkedIn to begin building your brand and finding opportunities as a student. This LinkedIn Learning course will help you discover how to make the most of your LinkedIn account -- and you don't need a LinkedIn Learning subscription to watch! We share some tips on creating a great profile and updating it along your career journey. We'll walk you through the basic steps of completing your profile and searching for jobs on LinkedIn. This LinkedIn Learning course will help you discover how to best leverage LinkedIn as a student. 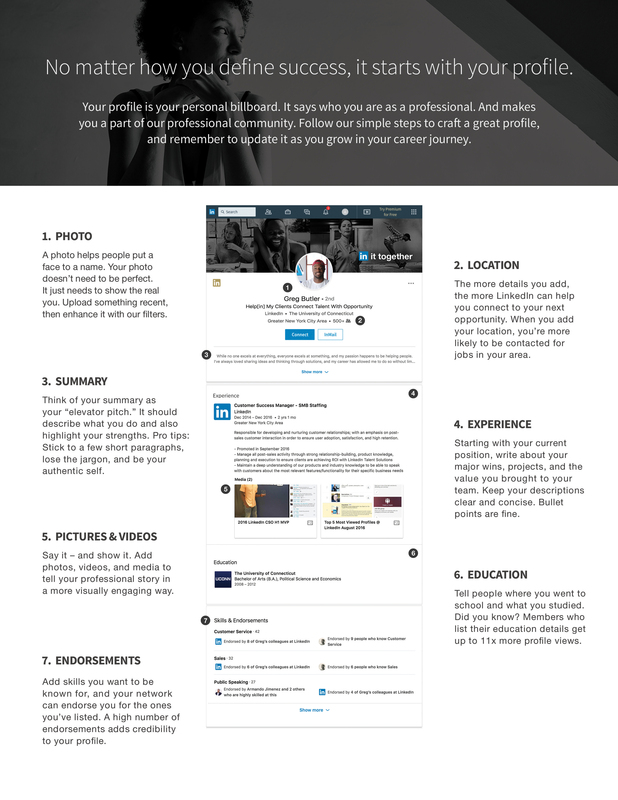 Use this handout to build your professional brand on LinkedIn. If you're a student, check out this handout for tips on communicating with other professionals on LinkedIn. We'll help you begin building your professional network to jumpstart your career. If you identify as a refugee or have recently resettled in a new community, check out our guide to leveraging LinkedIn. We've got tips and advice for translating your experience to the civilian workforce and building your community on LinkedIn. Leverage this LinkedIn Learning course to envision a new career, plot a transition plan, translate your experience, network into opportunity, and excel in your new role. Leverage this LinkedIn Learning course to work towards gaining admission to schools, excelling as a new student on campus, and using your education to establish an exciting career. We know that mentoring can be critical to success in your career. Check out these tips from MENTOR: The National Mentorship on surrounding yourself with the right people. If you're having a career mentoring conversation with a new connection, review this handout to prepare and make the most of the opportunity. Whether you’re about to leave the military, pursuing higher education, or looking for your next job, LinkedIn offers tons of resources to help you get ahead. Here's an overview. If you're a veteran looking to use LinkedIn to grow your business, check out the tips in our webinar. In this webinar, we share the top things that a veteran or military servicemember needs to know about making the most of LinkedIn. This LinkedIn post details actions and resources that you can use as a veteran to get ahead in your career. This article covers how you can leverage LinkedIn to advance your career as a military spouse. Get the skills necessary to envision a new career, plot a transition plan, translate your experience, network into opportunity, and excel in your new role through this LinkedIn Learning path. Get the skills to gain admission to schools, excel as a new student on campus, and use your education to establish an exciting career through this LinkedIn Learning path. Check out this LinkedIn Learning path to learn how to find and manage work opportunities best suited to your skills and needs and excel in the workforce. Make the most of your career transition with support from this in-depth presentation. Leverage the tips and resources in this in-depth presentation to get ahead in your career. We surveyed over 11,000 respondents across 9 markets in Asia Pacific to better understand common barriers holding people back from achieving their own definitions of success. We're inspired by the work you do to connect job seekers facing barriers to networks and meaningful careers. We invite you to integrate our LinkedIn training content into your own programming or share with the individuals you serve. For PowerPoint versions of any of our presentations, please contact coaches@linkedin.com. check out our LinkedIn for Nonprofits site. This content demonstrates how to use LinkedIn to connect to opportunities, from optimizing a profile for job search to building a LinkedIn network and finding jobs on the platform. This curriculum explores the concept of a professional brand and introduces students to the many resources available on LinkedIn, including mentors, jobs and internship opportunities. We share some tips on creating a great profile on the LinkedIn platform. This resource walks through the basic steps of using LinkedIn to find a job. Use this handout with students who are building their professional brands on LinkedIn. We share tips for students on communicating with other professionals on LinkedIn. We share advice for students who are beginning to build their professional networks. If you're working with recently resettled job seekers, check out our guide to leveraging LinkedIn. We've got tips and advice for veterans to translate their experience to the civilian workforce and build their community on LinkedIn. Use this example activity - or create your own - to explore LinkedIn with groups who are new to the platform. LinkedIn offers tons of resources to help veterans get ahead. Here's an overview. Share this in-depth presentation on making the most of LinkedIn with the military spouse community. This in-depth presentation covers how veterans and active servicemembers can use LinkedIn to transition to the civilian workforce. We're sharing insights from a study that covers over 11,000 respondents across 9 markets in Asia Pacific to help provide another level of transparency as we each pursue our own opportunities. If you're volunteering your time to support a job seeker on their career journey, we salute you! Check out the resources below to make the most of your relationship. If you're preparing for a career mentoring session, check out these tips to make the most of your conversation. Use this example scavenger hunt - or create your own - to explore LinkedIn with someone who's new to the platform. Leverage this handout when you're working with someone to update their LinkedIn profile and establish their professional brand. In this resource, we walk through the basic steps of completing a profile and searching for jobs on LinkedIn.